Gross, Robert F., ed. Tennessee Williams: A Casebook. Routledge (2002). আইএসবিএন ০-৮১৫৩-৩১৭৪-৬. Leverich, Lyle. Tom: The Unknown Tennessee Williams. W. W. Norton & Company; Reprint edition (1997). আইএসবিএন ০-৩৯৩-৩১৬৬৩-৭. Saddik, Annette. The Politics of Reputation: The Critical Reception of Tennessee Williams' Later Plays (London: Associated University Presses, 1999). Spoto, Donald. 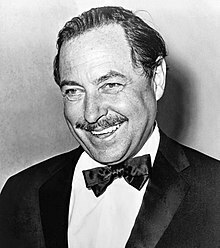 The Kindness of Strangers: The Life of Tennessee Williams. Da Capo Press (Reprint, 1997). আইএসবিএন ০-৩০৬-৮০৮০৫-৬. Williams, Tennessee. Memoirs. Doubleday (1975). আইএসবিএন ০-৩৮৫-০০৫৭৩-৩. Williams, Dakin. His Brother's Keeper: The Life and Murder of Tennessee Williams.